SpatiaLite is the spatial extension of the popular SQLite embedded relational database. GeoServer does not come built-in with support for SpatiaLite; it must be installed through an extension. Furthermore it requires that additional native libraries be available on the system. Proceed to Installing the SpatiaLite extension for installation details. The GeoServer SpatiaLite extension includes its own versions of SQLite (3.7.2) and SpatiaLite (2.4.0) and therefore these libraries need not be installed on the system in order to use the extension. However this internal version of SpatiaLite is compiled against the PROJ and GEOS libraries so they must be installed on the system in order for the extension to function. See Native Libraries for more details. This extension is supported for Windows, Linux, and Mac OS X. Both 32-bit and 64-bit platforms are supported. For Mac OS X only Intel based machines are supported (ie. not PowerPC). Download the SpatiaLite extension from the nightly GeoServer community module builds. Make sure to match the version of the extension to the version of the GeoServer instance. Ensure the native library dependencies are satisfied. The version of SpatiaLite included in the extension is compiled against the GEOS and PROJ libraries so they must be installed on the system. If the libraries are not installed on the system the extension will not functionand remain disabled. Pre-compiled libraries are available for the following platforms and can be found here. In general if the libraries are installed in a “default” location then they should be picked up by java with no problem. However some systems will require further configuration that differs based on operating system. The DLL’s must be copied into the C:\WINDOWS\system32 directory. If the libraries are not installed in a default search location like /usr/lib then the LD_LIBRARY_PATH environment variable must be set and visible to Java. Same as Linux except that the DYLD_LIBRARY_PATH environment variable is used. 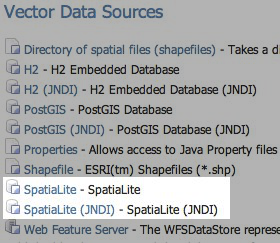 Once the extension is properly installed SpatiaLite will show up as an option when creating a new data store. database The name of the database to connect to. See notes below. schema The database schema to access tables from. Optional. user The name of the user to connect to the database as. Optional. password The password to use when connecting to the database. Optional, leave blank for no password. Connection pool configuration parameters. See the Database Connection Pooling section for details. The database parameter may be specified as an absolute path or a relative one. 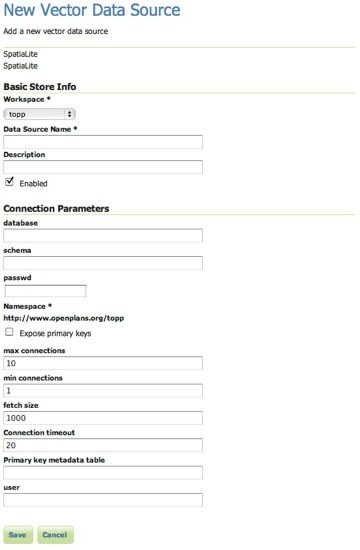 When specified as a relative path the database will created in the spatialite directory, located directly under the root of the GeoServer data directory.